The Lofoten Islands is a world-famous archipelago stretching out into the Atlantic Ocean in northern Norway. Known for its massive mountains and stunning scenery, this Arctic oasis in northern Scandinavia is a mecca for individuals wishing to tour one of the most beautiful destinations in the world. 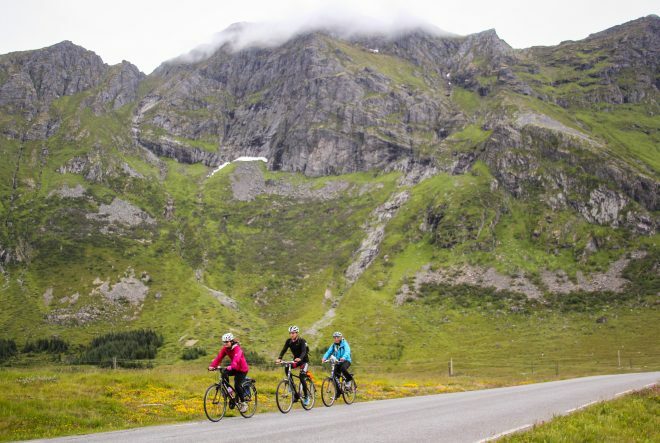 While it’s possible to come to the Lofoten Islands by bicycle and camp in a tent each night, the best way to see the area might just be on a self-guided bicycle tour like the one currently being offered by the local tour company, Discover Norway. 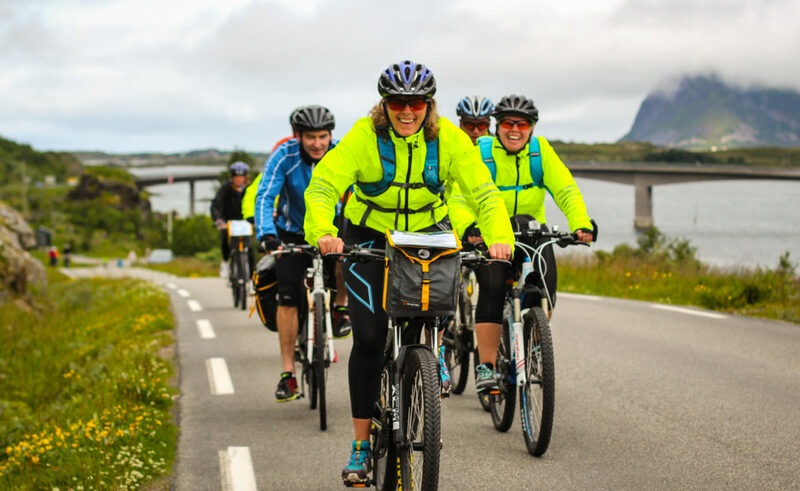 The “Lofoten from Svolvær to Å” bike tour with Discover Norway is an 8-day self-guided bicycle touring experience that you can do alone, with a loved one, a group of friends, or anyone you chose. Along the way, you’ll stay in beautiful Norwegian hotels, charming fishermen’s cabins, and eating some of the best food you’ve ever had in your entire life! To join the Lofoten Islands bike tour, simply visit the Discover Norway website and select the best travel dates. The company will then arrange everything from for you – from the bikes you ride, to the food you eat, to the accommodations you stay in each night. Discover Norway makes it incredibly easy for you to simply show up in Norway and enjoy a once-in-a-lifetime bicycle touring experience that you will remember for the rest of your life! 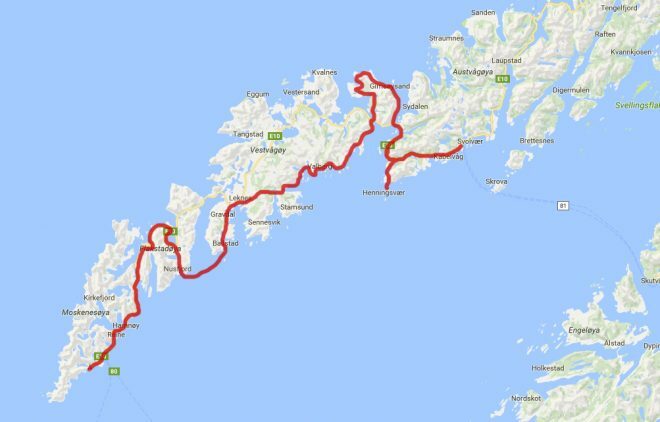 Above is a map showing the approximate route you will be taking over the course of the “Lofoten from Svolvær to Å” bicycle tour with Discover Norway. Optional: This tour can be combined with the “Arctic Coast Cycling” tour. Are capable of cycling moderate distances. This is a bicycle touring holiday that almost anyone can do. You need to be in decent physical shape to complete this tour, but you don’t need to be a seasoned bicycle racer. Casual cyclists with a just a small amount of bike riding experience will be perfectly suited for this bike tour. The distances each day are rather short (with the shortest day being 24 km and the longest day being 66 km), which gives you time each day to explore your surroundings both on and off your bicycle. Want a little bit of luxury on their bicycle touring holiday. If camping in a tent or going for days on end without a shower is not your thing, then this might just be the bicycle tour you’ve been looking for. On the Lofoten Islands bike tour with Discover Norway, you will get all the benefits of traveling long distances on a bicycle, but at the end of the day you’ll be able to stay in a high-end accommodation, take a hot shower, eat a delicious meal, use the Internet to stay in touch with friends and family back home, and still have time to relax and enjoy the company of your fellow travel companions. Don’t mind a little cold weather. The best time to go bicycle touring in the Lofoten Islands is during the summer months (May, June, July and August). The temperatures at this time of year can be downright sunny, cold and overcast, or outright pouring rain. You need to be prepared for anything! A good rain jacket is an absolute must and a pair of lightweight gloves is highly recommended. My experience with weather on the tour was incredibly positive. Over the course of the tour, it only rained on the last two days of the trip. The rest of the time it was either sunny and warm or overcast and chilly, but not especially cold. Whatever you do, don’t let the chance of poor weather stop you from participating in this tour. Trust me -you will live to regret it if you let the weather prevent you from exploring the incredible Lofoten Islands! Don’t want to waste time planning a tour like this on their own. 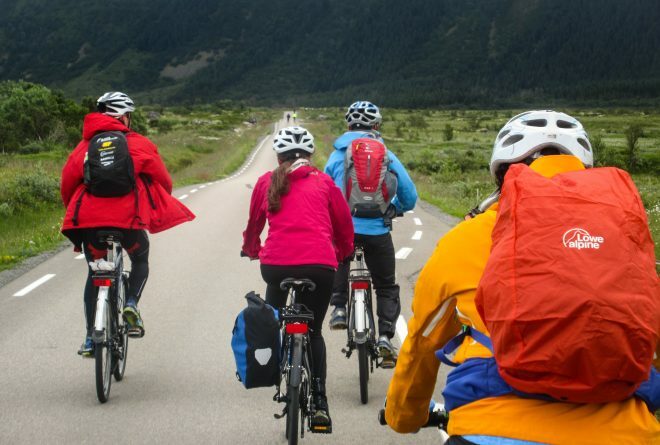 More than anything else, participating in this self-guided bicycle tour takes all the time, energy, and grunt work out of planning your Norwegian holiday. Instead of spending countless days and hours on the computer, researching possible routes and places to stay, just call up Discover Norway (or send them an email) and they will do all the hard work for you. 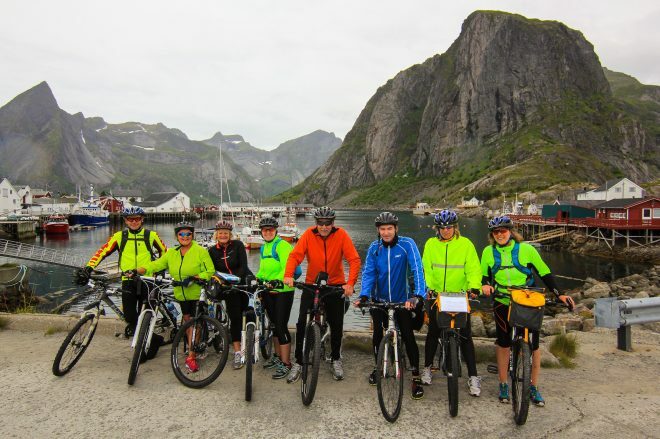 After your accommodations have been booked, your only job is to show up for the start of the tour, follow the instructions that have been provided for you by the company, and enjoy a week of cycling and relaxation on Norway’s incredible Lofoten Islands. Getting to Norway for the start of the Lofoten from Svolvær to Å bike tour is a piece of cake. Simply fly into Bodø, Norway and then take the ferry from Bodø to Svolvær. At the end of the bike tour, you’ll then need to take the ferry from Moskenes, Norway (near the town of Reine) back to Bodø, Norway. From there, you can board your plane and fly back home. It’s incredibly easy! When you sign up for the Lofoten Islands bike tour, Discover Norway will send you all the information you need in regards to how and when you should arrive in Norway for the start of the tour. The company is extremely knowledgeable of the Norwegian transportation system and will describe in complete detail everything you need to know to arrive safely and on time in Norway for the start of the tour. How Far Will You Be Cycling Each Day? Lofoten from Svolvær to Å is a unique bicycle touring experience because, even though cycling is a major part of your holiday experience, the distances you cover each day are much shorter than some of the other bike tours currently being offered by Discover Norway. Over the course of the 8-day bike tour, there are really only 4 mandatory days of cycling. The average distance you’ll be asked to cycle each day is approximately 40 km (25 miles). The shortest day of the tour is 24 kilometers and the longest day is 66 kilometers. The short distances on this bike tour gives you lots of time to stop and enjoy the sights along the way. There’s no need to rush from one hotel to the next. But if you do get to your accommodation for the night a little early and you still have some energy left, there’s always the option of riding a little further. Each nightly accommodation has additional hiking or biking possibilities nearby. Over the course of the tour, there are a couple bridges you will need to cross, but there are no major hills to climb. Small rolling hills are common, but much of the tour is flat – making the Lofoten from Svolvær to Å bicycle tour a cycling experience than almost anyone can complete. While you may choose to carry everything you need for the Lofoten Islands bike tour with you on your bicycle (in a set of panniers that you bring from home or have provided for you by the tour company), there is no need to carry your personal belongings with you on your bicycle each day as you ride. Instead, the tour company will transport your luggage from one hotel to the next at no additional cost. This allows you to ride your bike each day in complete comfort – while resting assured that when you reach your next accommodation, your personal items will be there and waiting for you. The included luggage transport is just one of the many reasons many people choose to participate in the Lofoten from Svolvær to Å bicycle tour with Discover Norway. It’s an incredible service that makes your time on the bike (and your time in Norway) that much more enjoyable. One of the best aspects of participating in the Lofoten from Svolvær to Å bicycle tour with Discover Norway is that they have organized the tour in such a way that you get to stop and enjoy yourself at some of the best accommodations in all of Norway. The Lofoten Island properties you’ll be residing at each night are unique, beautiful, and very Norwegian. The Thon Hotel Lofoten is the largest and most modern hotel of any you’ll be staying at on the Lofoten Islands bicycle tour with Discover Norway. This high-end hotel sports scenic views of the surrounding ocean, mountains and city – with an impressive restaurant, multi-lingual staff, and situated in the ideal location for your stay in beautiful Svolvær, Norway. Located on the water in the heart of little Henningsvær, the Henningsvær Bryggehotell is a charming and iconic white building serving up some of the best food and accommodations in all of the Lofoten Islands. Located on the scenic northern edge of Gimsøymyrene island, Lofoten Links is a trailer-style hotel with inviting accommodations and a friendly staff serving up delicious home-cooked meals. Located at the entrance to a well-manicured golf course and the base of a small mountain (Hoven – 362 meters tall), there are plenty of activities to do once you reach this memorable destination. Situated on the edge of the water in scenic Ballstad, Norway, the Kræmmervika Rorbuer is probably the least extravagant accommodation on the entire Lofoten Islands bike tour, but what the property lacks in structure is more than made up for when you look at its surroundings. With hiking, cycling and boating options nearby, beautiful Ballstad is a location worthy of your visit! After taking the cycle ferry from Ballstad to Nusfjord, you’ll check into the incredible Nusfjord Rorbuer. 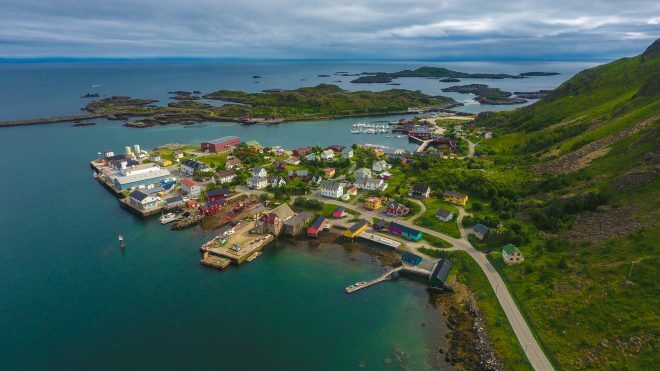 With large, homey fishermen’s cabins and some of the best food in all of Europe, this unique property on the edge of the Arctic waters will be difficult to get out of your memory – as the place is truly special in a way that you have to experience for yourself in order to believe. Finally, during the last two nights of the Lofoten from Svolvær to Å bike tour, you’ll be staying in the Reine Rorbuer AS. This uniquely Norwegian accommodation is spread out across multiple red cabins that line the water’s edge of beautiful Reine, Norway. From your welcoming apartment-style room, you’ll be able to explore the properties scenic surroundings. The food here is also really, really good! Speaking of food, the food and drinks in Norway are amazing. 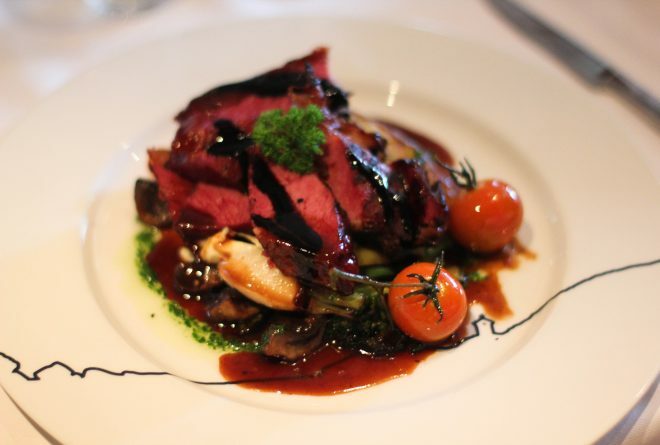 Whether you are in the Lofoten Islands or anywhere else in the country, you can expect the very best when it comes to your various dining options. The breakfasts on tour are a buffet-style breakfast with an assortment of fresh foods to choose from (bread, yogurt, cereal/muesli, eggs, meat, waffles, fruit, veggies, juice, coffee, tea, and more). Simply take the food you like and then sit down in the hotel restaurant to enjoy your meal. As you eat, look out across the waters of the fjord and enjoy your scenic surroundings. Then, in the evening, after you’ve arrived at your accommodation for the night and taken a well-deserved shower, you’ll eat dinner in the hotel restaurant. Each accommodation on the bike tour (whether it is a hotel or a fishermen’s cabin, will have its own dining area or restaurant). It is here that you will be served a delicious meal made from local fish and cuisine. Soups, salads and salmon are extremely popular, but there are vegetarian and vegan options available if you ask for them in advance. The food in Norway is seriously so good that once you return home, you’ll have a hard time finding something you want to eat. Norwegian food is fresh, elegantly prepared, and memorable. You’re going to love it! 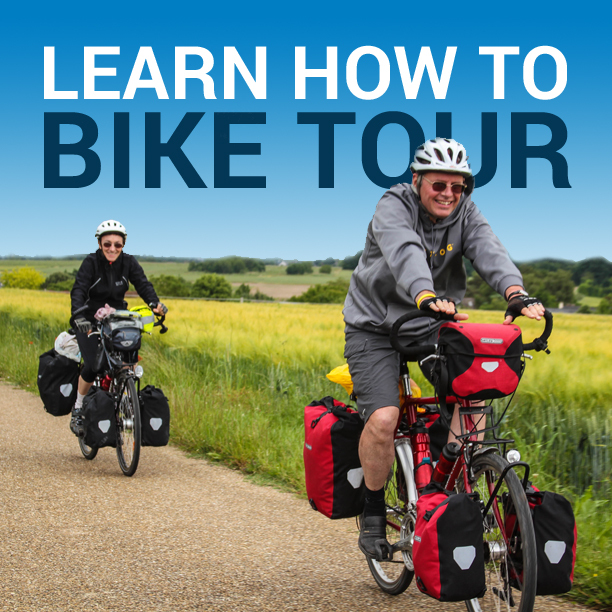 This is a self-guided bicycle tour, so you will be traveling on your own, without a guide. However, all the details for the bike tour will have been arranged for you in advance. All you have to do is show up for the start of the tour in Svolvær, Norway and then follow the instructions that the Discover Norway has provided for you each day. 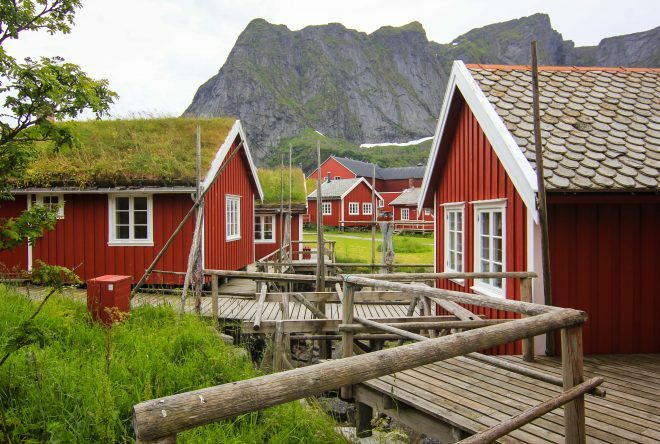 In addition to the cost of the bike tour itself, you will need to get yourself to Svolvær, Norway for the start and home from Reine at the end of the tour. Discover Norway will provide you with all the information you need to get to the start of the tour and get home at the end of your time in the Lofoten Islands. At the start of the Lofoten Islands bike tour you will be given a packet of papers containing all the information you need for the duration of the trip. This packet of papers hat you’ll be given contains maps of the routes you will be cycling each day, information on the sights you can expect to see throughout the tour, your hotel information each night, and details on the optional excursions along the way. You can choose to bring your own bicycle with you on this bike tour, but most people rent one from the tour company. That way you can simply show up in Svolvær for the start of the tour and have a bicycle waiting for you when you arrive. The cost for renting a bike and helmet from the company for 8 days is 1,800 NOK. If you do have any health or dietary restrictions, make sure you tell the people at Discover Norway in advance. They will go out of their way to make sure you are catered to and happy throughout your cycling holiday. Vegetarian and vegan meals options are available! If you have the time and would like to see more of Arctic Norway, consider doing this bike tour in conjunction with the “Arctic Norway Cycling” tour, which begins in Tromsø, Norway and ends in Svolvær where the Lofoten Islands bike tour begins. The “Arctic Coast Cycling” tour adds an additional 9 days to your travels in Norway and is a great way to see more of the Norway’s most famous island archipelago. This entry was posted in Bicycle Touring Pro Articles, Featured Articles, Main Articles, Norway, Product & Service Reviews, Uncategorized and tagged ballstad, bicycle touring in norway, Bodø, discover norway, Henningsvær, lofoten, lofoten islands, lofoten islands bike path, lofoten islands bike tour, norway, norway bike tour, norwegian, reine, svolvaer.